In 2006, this new voice emerged from the Cape Verdean archipelago in the Atlantic Ocean with her debut album “Navega”, a collection of songs that are as grounded in the traditional music from her homeland as they are nourished by different musical styles and colours. Mayra Andrade was born in Cuba in 1985, spent her earliest years in Cape Verde and since the ‘90s she has lived in several places, including Senegal, Angola and Germany. In 2001, while still a teenager, she won the gold medal at the French-speaking “Jeux de la francophonie” in Ottawa, Canada. “I’ve spoken French since I was six years old. It’s like a third language to me.” She finally touched down in Paris, drawn to the capital city’s cosmopolitan blend of many different cultures. It proved to be the ideal location to find her path, both personally and musically. 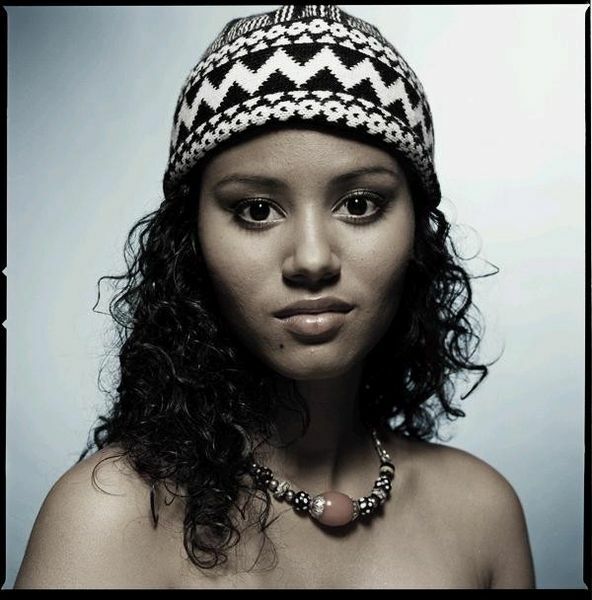 "Mayra Andrade (born 1985 in Havana, Cuba) is a Cape Verdean singer who lives and records in Paris, France. Andrade was born in Cuba but grew up in Senegal, Angola, and Germany. However, she spent around two months of the year in the Cape Verdean island of Santiago. The first song she remembers singing is "O Leãozinho" by the Brazilian musician Caetano Veloso, whom she has cited as a musical influence. Andrade often performed as a teenager and won the 2001 Jeux de la Francophonie songwriting contest at 16, beginning voice lessons in Paris at 17. “This album bears the mark of many journeys.” To kick off the conversation, Mayra Andrade shares the basic theme of “Stória, stória...”. She started working on this album in the autumn of 2008, following a long series of performances. Mayra Andrade is a headstrong woman who wants to be free to go wherever she wishes. “Singing is practically sacred to me!” she claims, which probably explains why, as a young artist, she took the time to perfect her musical performances onstage, where her heart and soul shine. That’s where audiences discovered her and “specialists” eventually caught wind of her fantastic new talent. It’s also where she plans to bring her second album to life. Mayra Andrade then went on to broaden and deepen the project, extending invitations to artists from all musical backgrounds. Each one enriches her panorama and colors her soundtrack. In Paris, she called on the crystal-clear kora sound of Guinean Djêli Moussa Diawara, Nicolas Genest’s dreamy trumpet, Angolan Zézé N’Gambi’s agile rhythm and Brazilian Marcos Suzano’s masterful percussion. They are only a few in the long list of featured guests. Others joined them in Brazil: percussionists in Salvador de Bahia, brilliant pianist André Mehmari in São Paulo, and other percussionists at the legendary samba studio in Copacabana, “Compania dos tecnicos.” In Cuba, pianist Roberto Fonseca and tres player Pancho Amat came on board. “The choice of musicians was totally natural. I invited them because I knew they would add something to my music.” Each of them served her music impeccably, as did Jacques Morelenbaum, who arranged and directed the recording of the strings and Lincoln Olivetti, who arranged the wind instruments. Both proceeded with subtle sensitivity, creating a nuanced harmonic palette that perfectly showcases her voice." Between the lines of “Stória, stória...,” Mayra Andrade tells many stories – about day to day life, life in general, and love. “Some of the songs have an introspective feel to them.” Set back to back, they weave a colorful backdrop of images. “Juana” is a social/political commentary written in the early ‘90’s by the Cape Verdean Kaka Barboza, in which the singer mentions the plight of Cape Verdean women, the fall of the Berlin wall and ordinary people’s uncertain futures all in one breath. “Konsiensa,” a more introspective piece set to a batuku rhythm, shows her as she is, begging her conscience not to let her stand still in life, and the album’s title song, accompanied by a Brazilian children’s chorus, sings the praises of a multicultural society in which all colors unite. “Mon Carrousel” presented the twofold challenge of co-writing with Fabien Pisani in French and matching the rhythm of a Cape Verdean mazurka co-composed with Portuguese accordionist Celina da Piedade. The result is a peculiar merry-go-round “which mirrors the dual motion of life: it’s circular but also has ups and downs.” The image is stunning, and it perfectly represents the rest of this album."